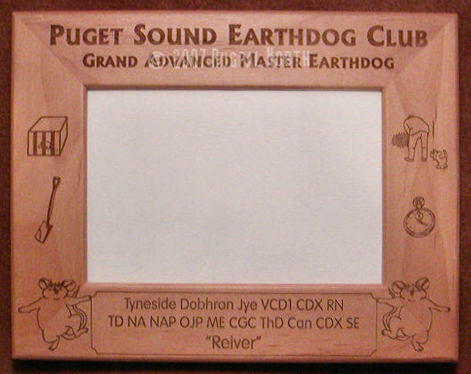 The Puget Sound Earthdog Club offers special awards to members whose ME titled dogs attain milestone earthdog achievements. Congratulations to all the big winners! You must be a member – full or associate – in good standing for one year to qualify for the awards. The accumulation of qualifying runs includes CKC legs as well as legs earned prior to joining PSEC. To apply for your award, provide a list of all of the qualifying legs, including the date earned to Kathi Ogawa. This information can be obtained through the AKC and the CKC. Also include your dog’s call name along with his or her registered name – including titles – as you want it engraved. Congratulations! Your dog can earn G.A.M.E. 2, G.A.M.E. 3, etc. and receive an award for each level attained. Please notate as such when submitting the qualifying information..
For those members whose dogs have earned 25 total master legs (this includes the original four titling legs), this qualifies your dog as a Silver Master Earthdog and a specially engraved frame to preserve the memory! For those consistent and great workers who stay with the game and have qualified with 50 (fifty) total master legs (this includes the original four titling legs), a big congratulations for earning the outstanding Golden Master Earthdog award to commemorate the momentous feat!